The annual Rotary Club open gardens event in Market Rasen was another success, with visitors from far and wide travelling to the town . A sunny Saturday saw 13 gardens in Market Rasen and the surrounding area open to the public for charity. From traditional gardens to a carnivorous plant nursery and a garden boasting a model rail layout, the visitors had plenty to see throughout the day. In the market place, there were a number of stalls on a summer theme, as well as fundraising stalls. The town council’s burger van also did a roaring trade. 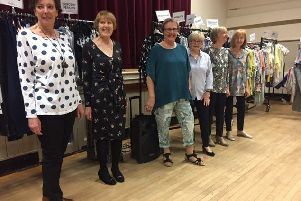 The nearby Festival Hall, was packed with craft and gift stalls, while the Rotary Ladies served refreshments for their chosen charity, Riding for the Disabled. Market Rasen Watercolour Group also mounted a display of their work in the hall - and a number were sold.